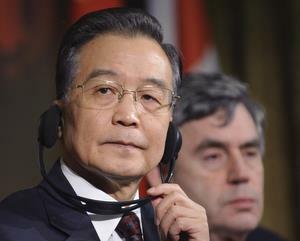 The Prime Minister of the People's Republic of China, Wen Jiabao joined the former US President George W Bush as the next top-ranking victim of a shoe-throwing incident. A protester threw a shoe at Wen as he was giving a speech at Cambridge University in the UK on Monday, the BGNES news agency reported. The shoe missed the Chinese PM landing about a meter away from him. The young man who assaulted him with his shoe was shouting "how can the university prostrate itself with this dictator?". He has been detained by the police. PM Wen's visit to the UK has been marked by repeated civil protests over the issues of Tibet and human rights. China's PM has become the second victim of shoe-throwing after an Iraqi journalists hurled both of his shoes at the former US President George W. Bush during a press conference in Baghdad in December.